If you know me well, you know I love chicken legs. If you ever see me eating fried chicken, it will be a leg. I’m not sure why the leg. Maybe I fell in love with dark meat at an early age while most of my friends gorged themselves on chicken tenders. But knowing me, it’s because I love street food, or food I can eat without a fork. Chicken legs required no muss, no fuss and best of all, no fork! In fact, my love of the leg is so well known that my grandmother hides a turkey leg in the back of the fridge for me at Thanksgiving. Since most of my family loves white meat, they don’t notice the one-legged turkey. It’s a little secret between Grandma and me. She still giggles while watching me, now full-grown, chow down on a whole turkey leg. There aren’t many times in life when I act so carnivorous as when eating poultry leggies. 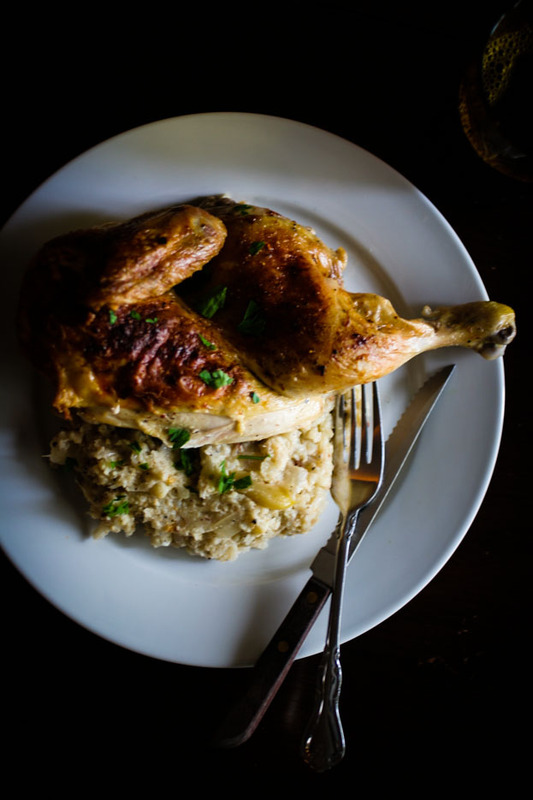 Here is a recipe for oven-roasted legs that is superb hot, cold or room temperature. May they make their way to your next picnic or your dinner table. I just have one request, hide a leg in the fridge for you for later. It will be our little secret. Note: If you would like more color on the chicken legs, you can place them under the broiler for a few minutes. Just keep an eye on them so they don’t burn! Combine melted butter, red pepper flakes, garlic, parsley, and lemon juice in a medium sized bowl. Season with salt and pepper. 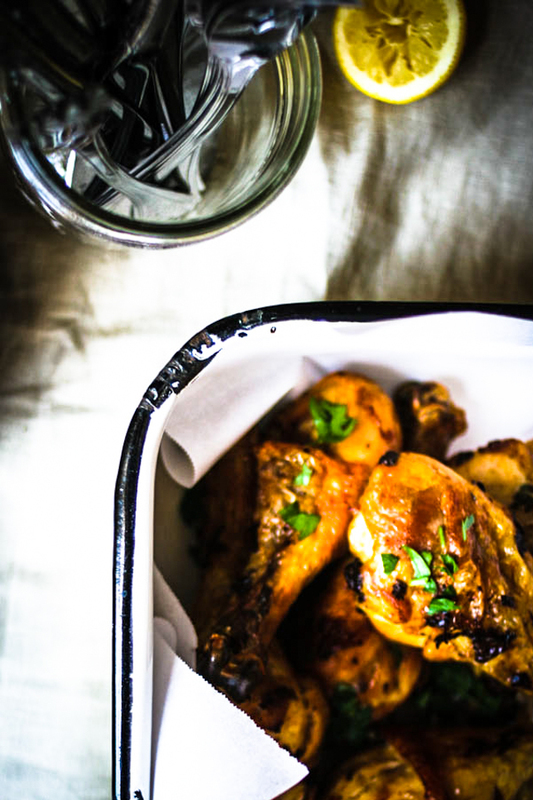 Toss chicken legs in the melted butter mixture, and place the legs on a roasting pan fitted with a wire rack. Roast chicken legs for 45 minutes or until the juices from the center of the chicken leg run clear. Let the chicken sit for 10 minutes to allow the juices to redistribute into the meat. 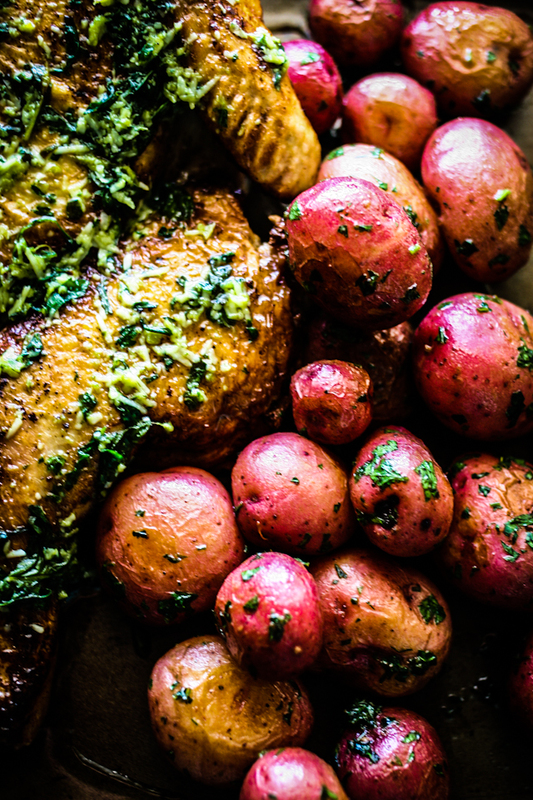 Serve with lemon wedges and fresh parsley. In the summer, spending stifling days in the South may seem like cruel and unusual punishment, but, for me, it had many great rewards. One of the greatest rewards occurred whenever my grandma decided to make homemade pizzas for lunch. It was my special treat for killing banana spiders, devouring honeysuckles, and kicking over crawfish holes. It was a rough job, but someone had to do it. 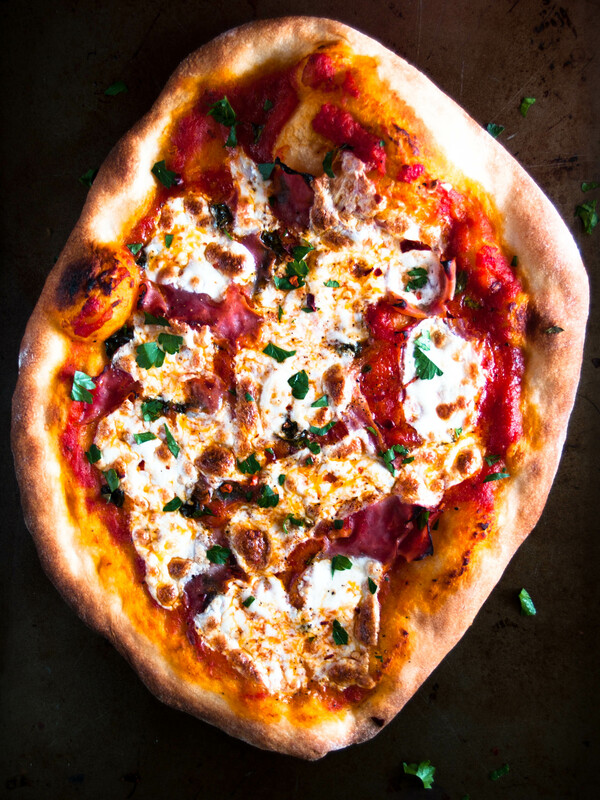 When my tummy started rumbling, I ran inside to find Grandma meticulously rolling out her bread dough and placing it on a piping hot pizza stone, topping the dough with spicy hamburger, creamy white cheese and fiery red tomato sauce. Grandma popped the pizza in the oven, and when it came out, the only sound was a tiny sigh of delight. The crust was crisp and sweet which complimented the cheesy, spicy toppings. I remember looking out the window at the summer’s day thinking of all the unlucky crawfish out there and kicking my little legs in pure contentment with a slice of my grandma’s pizza in hand. It was a good day. Preheat oven to 500 degrees. Place pizza stone in oven for 40 minutes. On a piece of foil, sprinkle lightly with flour and lay dough on top. Roll the dough out with a rolling pin to desired thickness. Spoon 2 tablespoons of sauce on the dough. Hand tear pieces of ham, a few pieces of cheese and seasonings onto the pizza. Place the pizza in the oven for 10-15 minutes. Once the pizza is brown and crispy, take the pizza out of the oven, scatter with fresh parsley. Repeat with the remaining 7 pieces of pizza dough. Enjoy! 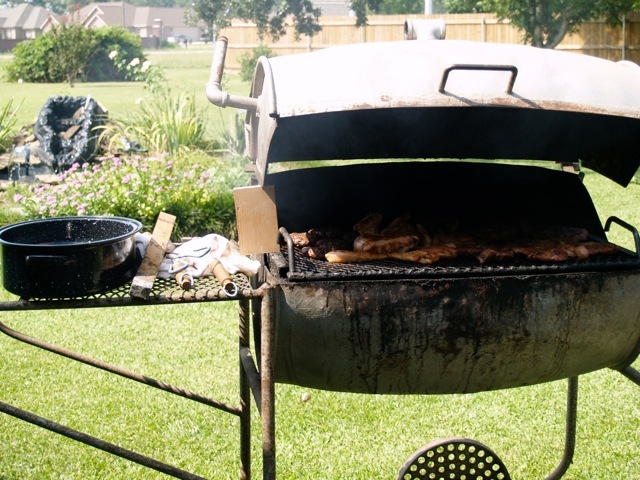 In the South, summer leads up to a sweltering 4th of July where food, freedom, and family goes hand-in-hand with barbecue, sweet tea and (unfortunately) flocks of mosquitoes. No matter how hard we tried, a trip to the store for lighter fluid and charcoal always seemed like the first order of business in the morning, that and getting pounds and pounds of both regular and smoked boudin from the local Market Basket. So with Community Coffee in hand, the women started to get to work on the fixins. Deviled eggs, which were slightly addictive from the addition of white vinegar. Slabs of French bread were sliced horizontally and brushed with melted butter and served with Jack Miller’s barbecue sauce for dipping. Pale yellow potato salad came modestly dressed with mayonnaise, mustard, salt, pepper and cayenne. Smiling half-moon slices of cold, juicy, ripe cantaloupe curiously counted as a vegetable (and not as a dessert.) Plump, meaty slices of homegrown tomatoes and skinny slices of cucumbers both covered with salt and pepper donned our holiday menu. I can remember the subtle creak of the screen door as I stretched it open to check on the progress going on outside (the creak reminded me of the sound a grasshopper makes while scratching one leg against the other.) The combination of Louisiana humidity and smoke from the barbecue instantly made my eyes sting, but the lovely, familiar waft of meat smoking away on the pit made up for any inconveniences. As this holiday is approaching this week, I have been reminiscing on this 4th of July memory as I sit in my yard-less, grill-less, loft in Nashville. Destined and determined, I pulled out my sturdy grill pan, cranked the heat to high on my electric stove, and seared a beautiful skirt steak to pure perfection. In my excitement, I failed to realize A) the entire place quickly began filling up with smoke, and B) I live in a loft, which means “opening up all of the doors” is not an option for ventilation. The whole place smelled of grilled meat, smoke and immediately my eyes began to water. I smiled as curiously as a cantaloupe. Success. I hope you and your loved ones are blessed this holiday with feasts, family, and fireworks! Note: This steak is particularly amazing served with this side and this sauce! Also, this recipe has only 2 ingredients, which means the quality of the ingredients really matters. 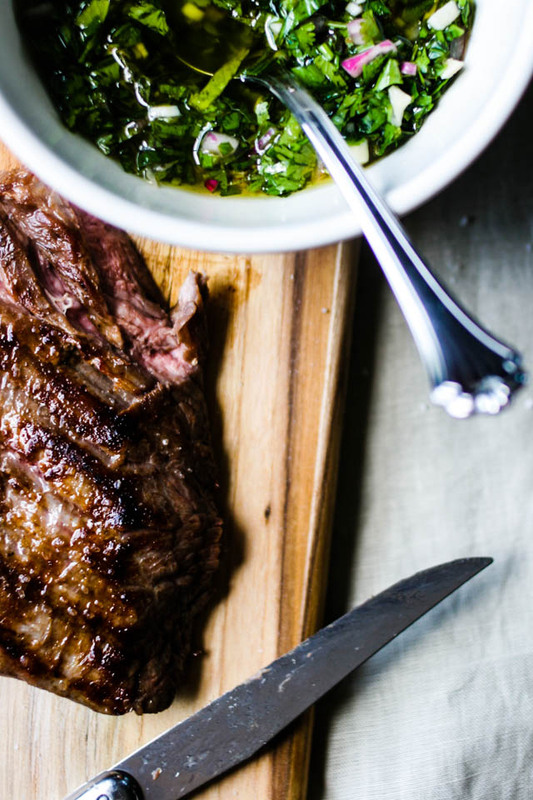 Make sure you get the best skirt steak you can find and use great quality salt as well! It makes all the difference in the world. Sprinkle coarse sea salt onto both sides of the steak and let sit at room temperature for 30 minutes. After 30 minutes, dab the steak with paper towels making sure the steak is as dry as can be. Season both sides of the steak with sea salt. Once the pan is ready, place the steak in the pan/skillet and let cook for 3-4 minutes per side for medium-rare. Let the steak rest for 5-10 minutes. This step allows all of the lovely juices to evenly distribute back into the meat. Thinly slice the steak at an angle, against the grain (not straight down into the meat.) This will ensure tender, juicy pieces instead of tough, dry pieces. Enjoy! First, I want to share some great news! 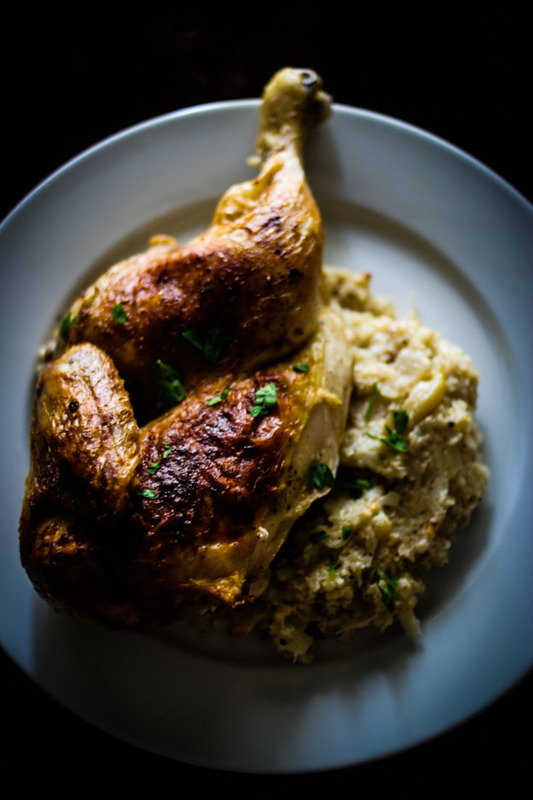 This blog is a finalist for Saveur’s 2013 Food Blog Awards as the Best New Food Blog. What an honor! Voting has already begun and ends this Friday, April 19th. Click here to vote! I am in company with so many talented people and blessed to be here. Thank you for all of your support! For me, cracking the fridge open at exactly noon means I need something in my tummy and QUICK. In pure desperation, I pull leftover dough, mustard greens and Parmesan cheese out of the fridge. 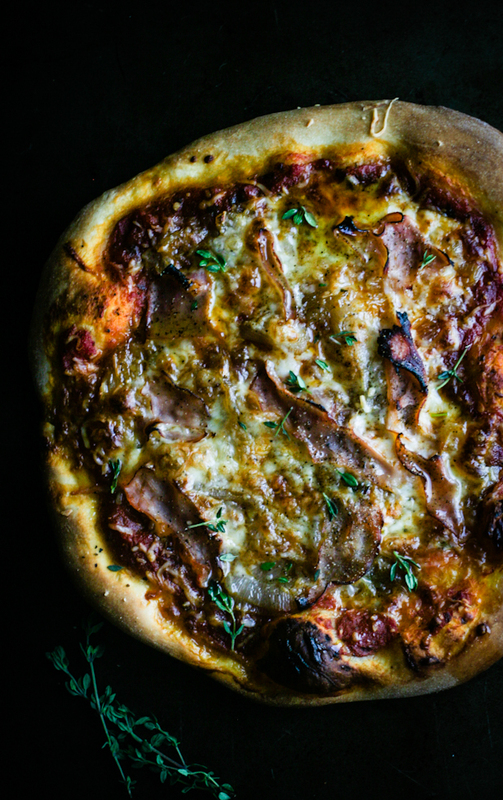 Because of my passion for combining Italian and Southern influences, my mind automatically wheels in the direction of creating a pizza with Southern flair. So with pangs in my stomach, I swiftly roll out the dough and slather it with marinara. While the pizza is baking, I quickly, quickly, sauté mustard greens with red pepper flakes, garlic and a squeeze of lemon juice. Once the pizza is golden and crispy, I pile the greens onto the baked pie and shave Parmesan cheese on top, and the result is unexpected perfection. Buon appetito, ya’ll. Pull the leafy greens off the tough stalks of the mustard greens. Discard of the stalks and set greens aside. In a sauté pan over medium heat, add the olive oil, garlic and red pepper flakes. Once the garlic beings to shimmer and shake in the pan, add the greens and juice from lemon. Quickly toss all of the ingredients together and sauté for 2 minutes. Take the pan off the heat, season to taste with salt and pepper and set aside. On a sheet of foil dusted with flour, place pizza dough in the middle and gently roll the pizza dough into a circle until thin (you can also pick up the dough and gently stretch the dough with your hands.) Spoon 2 tablespoons of marinara over the dough and spread close to the edges. Place in preheated oven for 12-15 minutes, or until golden and crispy. 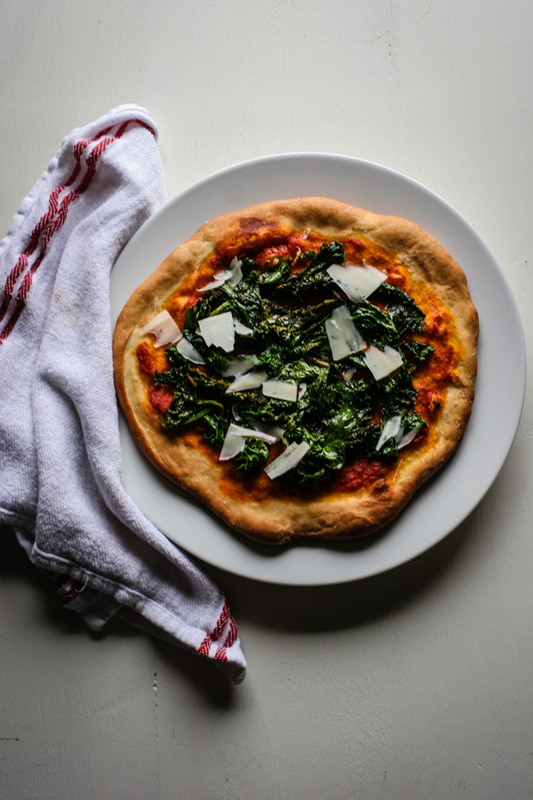 Transfer the pizza to a plate and scatter with prepared mustard greens and a healthy scattering of Parmesan cheese shavings. Enjoy! Please do not let this recipe discourage your spirit if you have never brined, pan roasted or cooked a chop in your life. Before this post, I was in the same boat as you. I find that this recipe relies on your kitchen instincts when drying out the chop, browning it and butter basting. When drying proteins, take a paper towel and really press the meat (or blotting it may be a better term) until there is no moisture on the protein. When browning the meat, make sure its golden. It should look beautiful at this point. If it’s not lovely and brown, it’s not done. Being a curious person, I constantly flip meat to take a peek if it’s browning, and in this recipe it is encouraged! There should be no hesitation when flipping the chop, just flip, flip, flip until it’s stunning. You can flip a pork chop and beef because there is no skin on these proteins, but you wouldn’t want to flip chicken breast with skin or fish, those you must flip only once. Now about butter basting, if you have ever watched a cooking show where the chef tilts the pan toward themselves and spoons melted butter from the bottom of the pan over the protein at a lightning-fast pace, that is butter basting. Fancy terminology, easy execution. Once you have this technique down, then you will find yourself using the same technique with different proteins like chicken, fish, beef, even vegetables. Have fun with it and make it your own! Note: Make sure when choosing the chop, that it is at least 2-inches thick. Anything thinner, you will risk the chop being too salty. That being said, please do not be tempted to salt the meat whenever you are cooking it. Trust me, you will ruin it. In a medium saucepan, bring 2 cups of water to a boil and add salt and sugar. Stir until dissolved. Add the peppercorns, garlic and 2 sprigs of fresh thyme to the water mixture. Add 4 cups of ice to the mixture and stir until the ice cubes melt and the water has cooled. 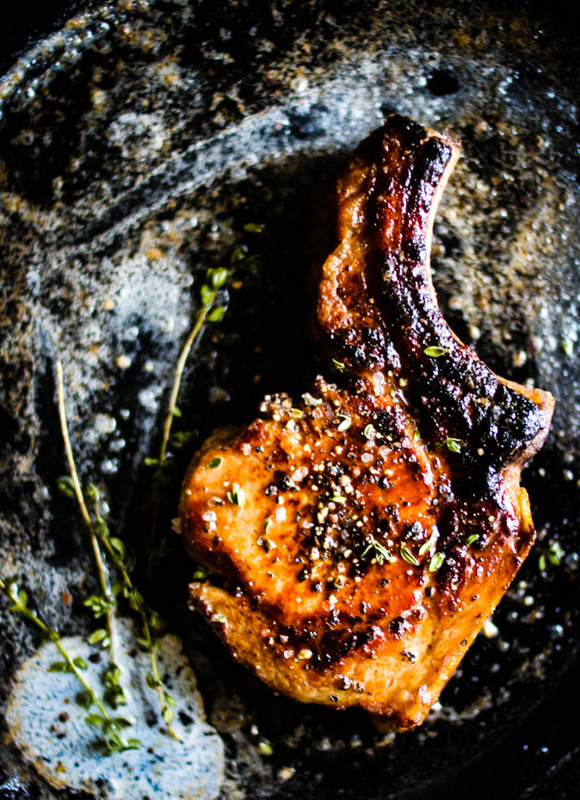 Place the pork chop into a gallon-sized Ziploc bag and pour brining mixture over the pork chop. Seal bag and chill in the fridge for 8-12 hours. Set a wire cooling rack onto a roasting tray and set aside. Remove the chop from the brine and pat dry with paper towels. Make sure that you get the chop as dry as you can, this will help the chop brown nicely. Heat oil in a cast-iron skillet over medium-high heat. Place the chop into the hot pan and begin browning on each side, flipping about every 2 minutes until both sides are golden brown. Place the skillet into the oven and continue flipping every 2 minutes (for a total of about 12-14 minutes.) Allow the pork to reach 135 degrees in the center and take out of the oven. Drain the fat from the pan and place on a medium heat. Add the butter, remaining 2 garlic cloves and 2 sprigs of thyme. Once the butter has melted and becomes foamy, tilt the pan to one side and spoon the melted butter over the chop repeatedly until the butter starts to brown and turns nutty in aroma, 2-3 minutes. Immediately take the skillet off of the flame so that the butter does not burn. Transfer the chop to the prepared wire rack and let rest for 15 minutes to allow all of the wonderful juices to redistribute evenly. Sprinkle the pork with cracked black pepper. Cut the pork from the bone, slice and serve! Thank you for your many gifts. Thank you for allowing me to slow down, to think more clearly and to become healthier for the year to come. Thank you for covering the earth with a blanket of white, protecting the ground below for the spring to come. Thank you for allowing me to don thick, deer-printed scarves and bear hats without shame against your artic breeze. Thank you for never telling anyone about the time I ate a whole roll of cookie dough to keep warm one lonely winter night…ahem. Thank you for bringing loved ones together, huddled closely next to a warm fire. Thank you for the bright vegetables and citrus that you provide to nourish my body and give me strength. And most of all, thank you for change. No matter how harsh a season may be, there is hope in knowing that whatever the time may bring, it will come to a close, and spring will reveal its lovely blooms. No season lasts forever, for good or bad, but there is comfort in knowing that change will always come, whether wanted or unwanted. In a world of uncertainty, that is a comfort. Winter, dear winter, will be a distant memory, but like a loved one, it always comes back, begging for our attention and wooly socks. So for this one moment, this one flake in time, I will thank you because there is a beauty, a stillness and silence in you that is unlike any other season. You make the spring that much sweeter, you are the perfect foil to a summer’s breeze and you gently, patiently step in after the autumn leaves have finally found their place of peace. 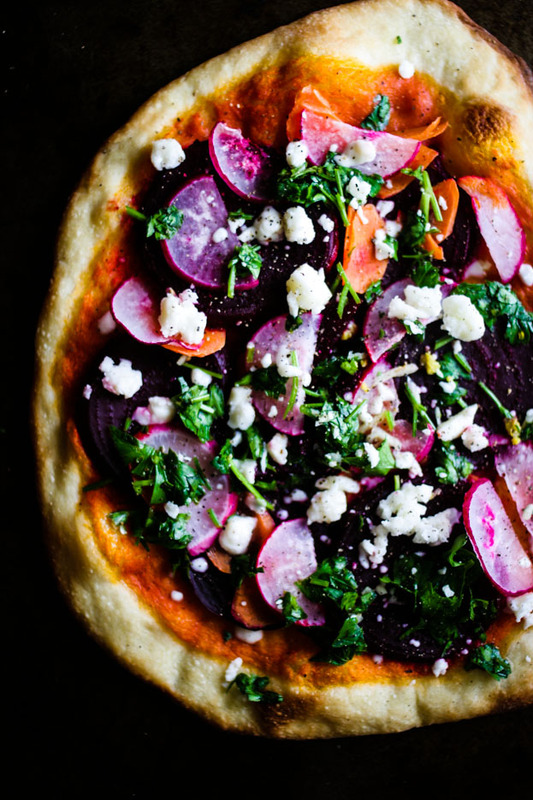 This recipe highlights just a few winter vegetables. Feel free to use any of your favorite vegetables for this dish! Preheat the oven with a pizza stone to 500 degrees. On a sheet of foil dusted with flour, place 1 piece of pizza dough in the middle and gently roll the pizza dough into a circle until thin (you can also pick up the dough and gently stretch the dough with your hands.) Spoon 2 tablespoons of the tomato sauce over the dough and spread close to the edges. Place prepared beets, carrots and radishes onto the top. Put the dough in the oven for 10-12 minutes or until the crust becomes golden brown in color. Sprinkle feta and gremolata over the top of the hot pizza. Finish with pepper and vinegar or lemon juice if you want to add extra acidity to the pizza! In a sauté pan on medium temperature, heat olive oil. Add sliced garlic and red pepper flakes and cook for 30 seconds or just until golden. Add the tomatoes and season with salt and pepper. Add sugar. Bring to slight boil and let simmer for 30 minutes. Take off heat and add basil leaves. Set aside. Combine 1 small handful of finely chopped parsley leaves, 1 minced garlic clove and the juice and zest of ¼ of a lemon and stir to combine. Keep in fridge until ready to use. As the fog clings to the ridge of autumnal foliage, so do I cling to the plaid wool covers that rest on my lap. These are the days when reading a book by the fireplace is about all I can muster. I want to enjoy the soggy, foggiest of days of fall as much as the past summer days spent in the sun. I want to soak in, dig deep and fall asleep surrounded by a clouded mountain. And it’s also on these days when I want something warm and comforting that requires the slightest amount of effort. Braised pork simmering and shimmering slowly in the oven, marrying with apples, sweet onions and garlic is what I want. It’s blanketed in its own cloud of steaming pressed apple cider as it tenderly breaks down the meat for hours and hours on end while I doddle the day away. All the flavors of fall without the fuss, that’s what I prescribe on a blustery, foggy, lazy, lovely day. Season the pork shoulder with salt and pepper. Tie pork together with kitchen twine to create a cylinder, tying ½ inch interval knots. Place the pork in a heavy-bottomed pot, uncovered, at room temperature for 2 hours. Place onion, garlic, chicken stock, apple cider and ginger ale in the pot with the pork. On a high flame, bring the mixture to a boil. Once the mixture has come to a boil, place a lid on the pot and leave in oven to cook for 4-5 hours. Allow pork to cool and place in the fridge overnight. Place the pork on a cutting board and cut the strings from the meat and discard. Slice the pork into ½ -1-inch medallions and place in a shallow roasting tray. Strain the sauce and add half of the liquid to the pork (discard remaining liquid.) Place sprigs of rosemary around the pork. Cover tightly with foil. Place in oven for 20 minutes, just to heat the pork through. 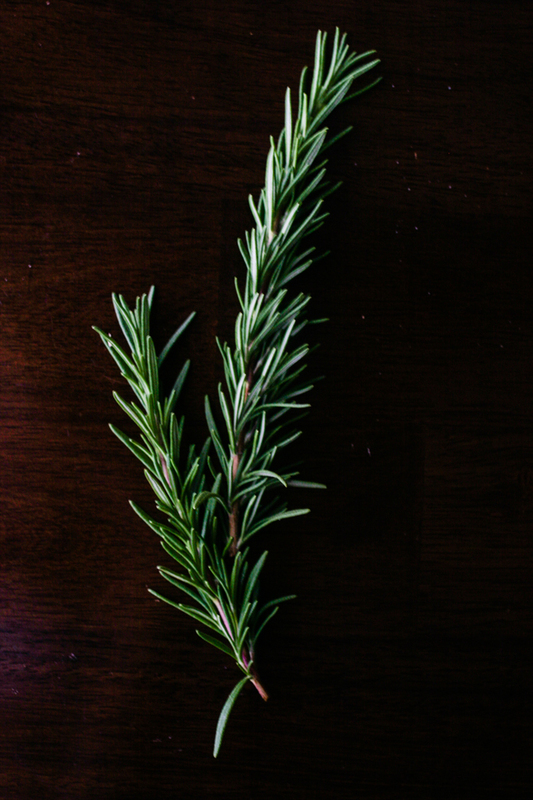 Discard the rosemary springs. Serve with roasted vegetables of your choice. Enjoy! All this happened before, and it will all happen again. Poised with a list in hand and as focused as a camera, I whipped through the automatic doors to my neighborhood grocery store. Starting with the produce, I found myself gapping like a guppy at the pears and hoarded all of the shallots I could fit into my basket. An angel that must have fallen from heaven generously offered me a cup full of freeze-dried strawberries. Who knew?? They were lovely, tangy and I felt like an astronaut eating them. I strolled through the deli section, sampled a little Virginia ham, and bought a pound! Oh, my shopping was going like gangbusters. But you don’t want to hear about a perfect shopping trip, do you? It was in my moment of pure enthusiasm when I realized I was missing an essential ingredient for my supper, grits for the grits soufflé. I circled around the cereal, floundered around the flour, and ended up ogling inanely at almond butter for no reason whatsoever. Grits rained on my parade, or the lack of grits really. My head began to spin. I stared hopelessly at the lucky people passing me by, racing to the checkout line. In a desperate panic, I looked down at my basket. Life handed me ham, shallots and pears. Roasted pears could be for dessert, check. And for dinner, PIZZA. When in doubt, pizza. If ever there was an answer to question that’s questionable, pizza. Sautéed shallots drowning in hot butter seemed a lovely choice for a topping and paired well with the ham. A sprinkling of thyme for good measure should do the trick. The results were better than I ever imagined. Thyme, ham and shallots are best friends in my book. And I am confident to say that no one even missed the grits. Preheat oven to 500o with a baking sheet or pizza stone preheating in the oven as well. Roll out rounds of dough thinly onto a piece of foil lightly dusted with flour. Pour a few tablespoons of red sauce onto the dough. Scatter ¼ of the shallot mixture onto the sauce. Hand-tear ham and scatter on top and finish with mozzarella. Place the prepared pizza in the oven for 10-15 minutes or until the crust is golden brown. 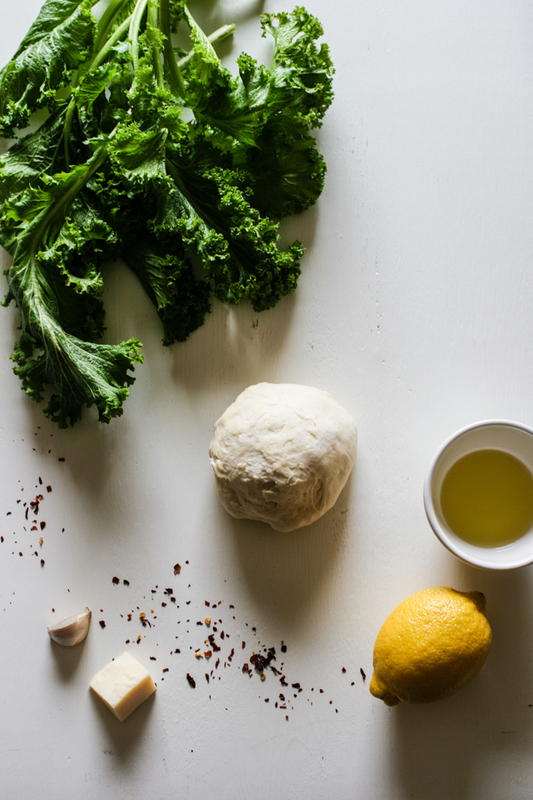 Dress each baked pizza with a drizzle of olive oil, cracked black pepper and thyme leaves. Continue with the remaining pieces of dough. Enjoy! In a small pan, melt the butter on medium heat. Add shallots, thyme and seasonings to the pan. Sauté shallots until softened but not browned. Set aside. While living in Texas, tubing trips down the Guadalupe River quickly became an end of the summer tradition. Long, hot days melted away with a lazy ride down the lengthy, winding river. There was nowhere else I wanted to be, except whenever I would smell the glorious vittles coming from Gristmill Restaurant in the historic district of Gruene. Sitting under towering oak trees while watching the meandering river created a relaxing atmosphere for a glorious meal. One of my favorite dishes was a classic meat and potatoes dish. The chicken was cooked to perfection and then covered in the most beautiful, fresh green sauce. Their potatoes were mashed with the skins on and seasoned perfectly. When I’m craving the mill, this is the dish that I crank out while dreaming about the Guadalupe River on a crazy, hazy, lazy, summer day. In a sauté pan, crank the heat to high with oil in the pan. Combine the butter, red pepper, black pepper and salt together with a fork. Going on top and under the skin of the chicken, slather on all of the butter mixture. Once the oil comes to a smoking point, lay the chicken skin side down onto the pan. Be careful, there is moisture in the butter that will make the oil sizzle so try to lay the chicken away from your body. Place a foil-lined skillet on top of the chicken. Let the skin crisp in the pan for 5-10 minutes. Once the chicken is crisp, place the whole pan/skillet/chicken combo in the oven for 40-50 minutes. Let the chicken rest after taking it out of the oven to reserve all of the juices. 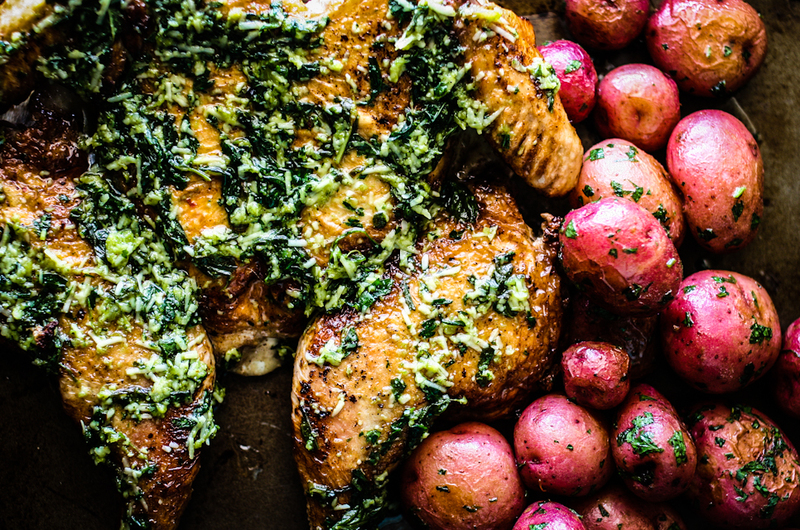 Slather skin with the pesto. 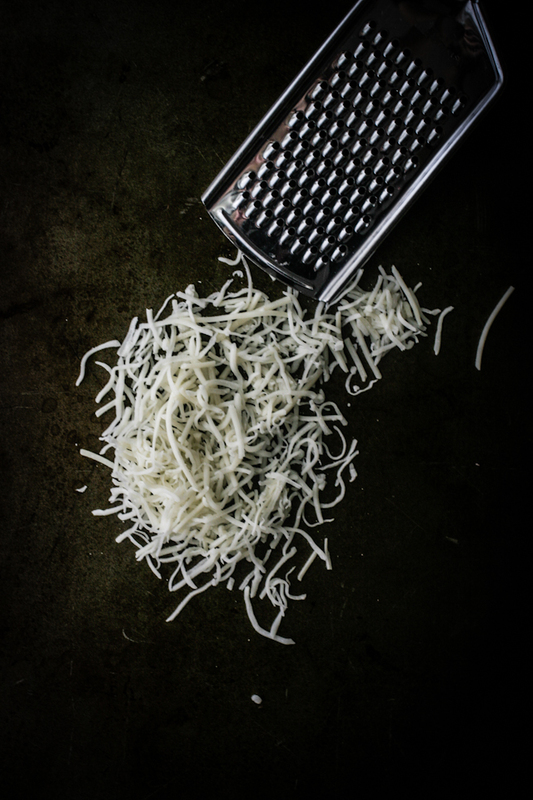 In a mortar and pestle, crush garlic, salt and pepper flakes together. 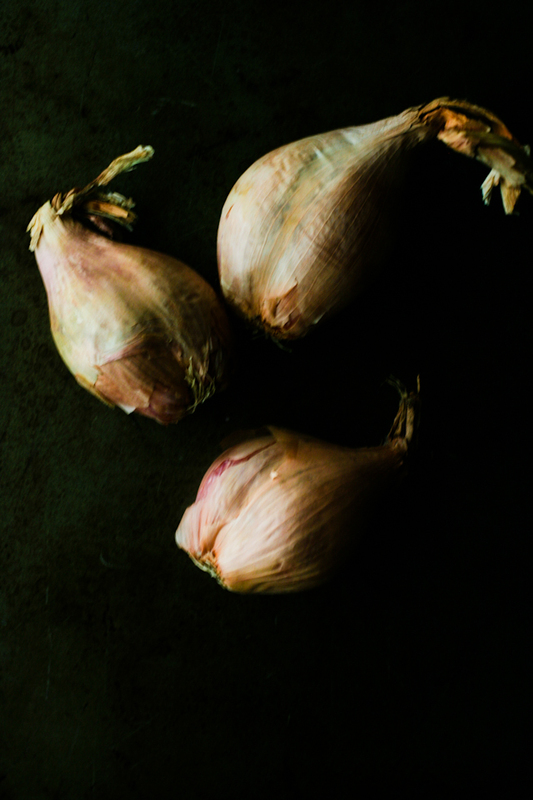 Pulverize the garlic into very small pieces. Add the herbs. Crush the herbs until the basil and parsley are in very small pieces. Add half of the cheese. Keep pulverizing the mixture together. Add the rest of the cheese and the olive oil. If you want a smoother pesto, add a little more oil. Season with salt and pepper to taste. Keep in fridge until ready to use. In a large pan with a lid, melt the butter on low heat. Once melted, add potatoes, red pepper and salt. Place the lid on the pot and cook, covered on low heat for 30-40 minutes. Check the doneness of the potatoes once the largest potato can be poked with a fork with ease. Turn off the heat and let steam for 5 minutes. Sprinkle with parsley and season with salt and pepper to taste.